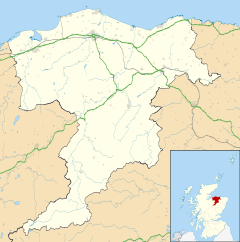 Forres (/ˈfɒrɪs/; Scottish Gaelic: Farrais) is a town and former royal burgh situated in the north of Scotland on the Moray coast, approximately 25 miles (40 km) east of Inverness and 12 miles (19 km) west of Elgin. Forres has been a winner of the Scotland in Bloom award on several occasions. There are many geographical and historical attractions nearby such as the River Findhorn, and there are many historical artifacts and monuments within the town itself. The earliest written reference to Forres may be the Οὐάραρ εἴσχυσις (Ouárar eíschysis, 'Varar Estuary') mentioned in the second century Geography of Claudius Ptolemy. A royal castle was present in the area from at least 900 AD, and around 1140 AD Forres became a royal burgh. Royal burghs were founded by the Kings of Scots of the 12th century to encourage trade and economic improvement. The local abbey was plundered by the Wolf of Badenoch. On 23 June 1496 King James IV of Scotland issued a Royal Charter laying down the rights and privileges that the town's people are believed to have held by an earlier charter since the reign of King David I some 300 years earlier. The population of Forres has grown in recent years is now over 12,000. Sitting between the floodplain of the River Findhorn and the wooded slopes of Cluny and Sanquhar Hills, Forres is well known for its award-winning floral sculptures and is steeped in local history and traditions. Local bars and pubs include The Newmarket, The Red Lion (known locally as "The Beastie") The Mosset Tavern, and The Carlton Hotel. The town is the location of Sueno's Stone, an enormous carved stone probably created by Picts to commemorate a battle against Norse invaders. The stele is 20 feet (6 metres) tall and encased in glass structure to protect it from the elements and graffiti. Sueno's Stone translates to Sven's Stone. Brodie Castle lies near the town. Other attractions to Forres include Dallas Dhu distillery, which lies just south of the town; although no longer producing, the distillery is maintained in working order by Historic Environment Scotland. Benromach Distillery, located just north of the Forres bypass, is an active distillery with a visitors' centre. Shakespeare's play Macbeth locates Duncan's castle in Forres, and the Three Witches meet on a heath near the town in the third scene of the drama. Macbeth's castle was located at Inverness. There is a large network of walking and cycle paths with a spectacular, well marked mountain bike trail in the woods behind the park in the town. Findhorn Bay, home to seals and dolphins, is only 4 miles from the town and is easily accessible via a cycle path. Forres has a considerable alternative and new age community as the Findhorn Foundation as well as Newbold House own two large buildings in the town. Forres is a Transition Town and is home to many organisations that focus on sustainability. There is a relatively large community of artists such as Orchard Road Studios, Findhorn Bay Arts and The House of Automata and various other galleries and arts organisations such as the soon to be National Unicorn Museum in the pipeline. The Glasgow School of Art established a campus focusing on design and innovation in the town in January 2016. Forres was a parliamentary burgh, combined with Inverness, Fortrose and Nairn, in the Inverness Burghs constituency of the House of Commons of the Parliament of Great Britain from 1708 to 1801 and of the Parliament of the United Kingdom from 1801 to 1918. The constituency was abolished in 1918 and the Forres and Nairn components were merged into the then new constituency of Moray and Nairn. As with the rest of the British Isles and Scotland, Forres experiences a maritime climate with cool summers and mild winters. The nearest official Metoffice weather station for which online records are available is Kinloss, about 3 miles north east of the town centre. The lowest temperature to be recorded in recent years was −16.0 °C (3.2 °F) during December 2010. Forres is situated on the A96 trunk route connecting the cities of Aberdeen and Inverness. The River Findhorn was originally crossed by fording near Waterford Farm. A suspension bridge was opened in 1831 to cross the river at the west end of the town. This bridge was replaced by the current bridge in 1938. Due to high volumes of traffic passing through the town centre, a bypass was built in the late 1980s to reduce congestion in the town centre. The A940 connects Forres with Grantown-on-Spey, Aviemore and the south directly without the requirement of driving via Inverness. The B9011 connects Forres to Kinloss Barracks and Findhorn Bay. Forres railway station is situated just outside the town and is operated by Abellio ScotRail. The town of Forres was once a triangular junction in the Highland Railway network, travelling through Forres was once the quickest route to reach Inverness from the south. Originally the station had four platforms; two of which were on the north side of the triangle on the route between Inverness and Aberdeen, the third on the south west side of the triangle used by services to Grantown-on-Spey. The fourth was a short platform on the south east side used by through services between Elgin and Aviemore via Grantown. Trains from Grantown towards Nairn or Inverness had to run through the station and then reverse back into the Aberdeen to Inverness platform and this is the only platform to remain in service today. The service to Grantown-on-Spey was closed in the 1960s and now forms part of The Dava Way, a scenic footpath connecting the two towns. The Inverness-Aberdeen down platform was also closed in the 1960s; although it still exists, it remains abandoned in-situ and its rail track and over-bridge have been removed. Inverness Airport is approximately 30 minutes away by road and provides links mainly to other airports across Britain. Moray Steiner School, Drumduan House, Clovenside Road (private school for 5–16-year-olds). Made famous when the Hollywood actress Tilda Swinton sent her children to the school. Forres has a host of various sporting activities within it including Forres Golf Course, which has held the Scottish Young Professionals championships a number of times. It also plays host to Highland Football League team, Forres Mechanics and Junior club Forres Thistle. Forres also hosts the Official Moray 5-a-side Superleague which runs every week at Forres Community Centre. Forres St. Lawrence is the local cricket cub. They are full members in both senior and reserve competitions in the area  as well as running a thriving junior section. Forres Harriers is the local running club with around 80 members. The most famous Harrier is Don Ritchie who at one time held 14 World Best Times for ultra distance running events ranging from 50 km to 200 km. Forres has two swimming clubs - the long established Forres Bluefins, as well as the UK's only specialist sprint swimming club, Free Style SC. Since 2011 an annual Triathlon has been staged in Forres. It consists of a 400-metre pool swim, 14 km mountain bike ride (changed in 2014 to a road bike race) and 3.3 km run. It takes place at the end of June. Since 2013 it has been organised by the Moray Firth Triathlon Club. Forres hosted the first race of the World Orienteering Championships 2015 on Friday 31 July, when the Sprint Qualification event is held there. Two days later on 2 August it also hosted the Sprint Final event. ^ "The Carlton Hotel" Archived 2010-04-30 at the Wayback Machine "forresweb.net/carltonhotel"
^ "Kinloss 1971-2000 averages". Met Office. Archived from the original on 2012-08-05. Retrieved 2 Nov 2011. ^ "Kinloss Extremes". KNMI. Retrieved 2 Nov 2011. ^ "Welcome to our specialist sprint swimming club" "FreeStyleSC.org.uk"